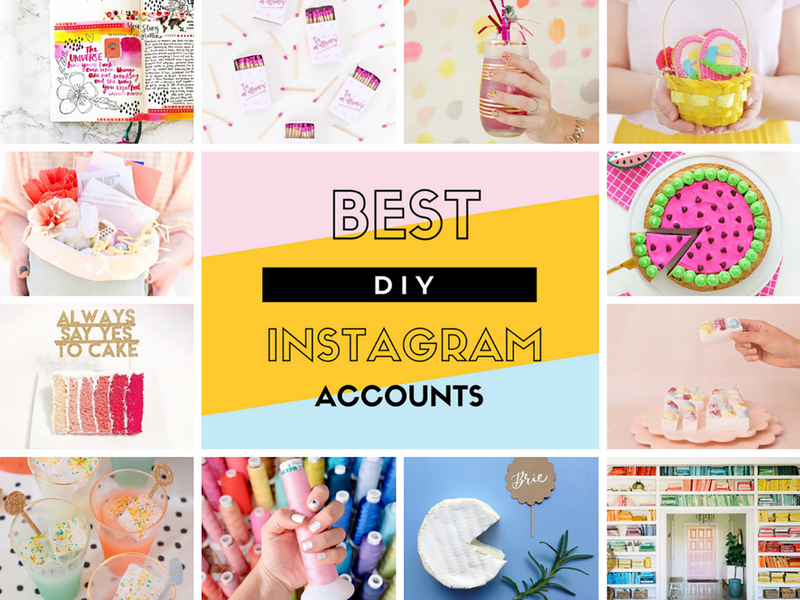 Today, I want to fill you with many inspiring ladies that fill my Instagram with tons of creative ideas, and special DIY projects that deserve an Oscar nomination. When it comes to doing everything yo'self, these are the queens, la creme de la creme, and the masters you need to follow, STAT. @aww.sam Besides being the absolute CUTEST, Sam is an industrial designer and my daily inspiration on Instagram. You can't miss her cakes and special donuts, it's just beyond! @abeautifulmess All I want one day is to finally meet the two lovely ladies behind the most amazing blog (that inspired me to start on my own), Elsie and Emma. A Beautiful Mess was the pioneer blog that started amazing DIY projects, and they keep surprising us every-single-day. @ohjoy Joy, mama of two, best dancer on IG stories, and shoe-twin is the entrepreneur behind OhJoy! I've been following her blog and now Instagram, read all her books, bought her suitcases, and cried a river with every design she has put out on the market. You are pure Joy, Joy. @studiodiy Kelly knows how fun life can be and I've admired her for a long, long time. Thank you for making my live a party every day! @sugarandcloth One word to you Ashley: WOW! This new mama is the cutest thing on the internet and er DIY are next-level-fun. Ps. Domino named her as the best DIY blog, just sayin' ok? @brittnimehlhoff Brittni, the sweetest blogger behind Paper and Stitch, featuring dreamy cocktails, super easy and super cute DIY projects and a dreamy color palette I wish I could achieve one day because a girl can dream, right? @designlovefest Hi Bri, I love you! Design Love Fest is one of the OG DIY, lifestyle and colorful bloggers around, and yes, I'm obsessed with her style, and her blog, duh. @johanie.creative My lovely friend and insanely talented DIY master, Johanie you'll love as much as I do. If you're looking DIY projects that are easy and hassle-free, she's your girl ladies and gents! @amyjadedesigns Is it normal that I dream about Amy's calligraphy skills? You'll be addicted as me, trust me! @daily_disco the sweetest babe on earth and most talented DIYer, making embroidered projects, pins, and personalized denim projects. Can we hug again? @dixieandtwine If you win a lotto ticket and need to pick one lady to hang with you, be sure Amber is my gal! fellow Canadian and etsy owner of the prettiest party decorations, she will make your gray days the most colorful ones, I promise you that. @lulafloradesign My friend Christine, fellow Montrealer and my number one mini pinata maker is the most talented maker behind a Mexican-styled etsy shop I've been following for quite long time now. I could write a love letter to her mini unicorns. TRUE story. @amytangerine This paper lover lady is the ultimate inspiration when it comes to scrapbooking, calligraphy and party planning. Love you, Amy! @shrimpsaladcircus I met Lindsay during our AltSummit days this year and I fell in love with her projects, her vibe and her Instagram account. Are we doing Alt together next year? Oh my goodness, lady, thank you so much for including me among such wonderful company! So glad we met at Alt. ❤ Bummed to be missing it next year, but have a blast for me!